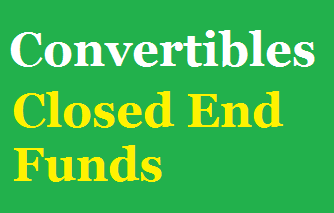 Investing in convertible closed end funds can be done easily. You can buy these closed end funds from your brokerage. Investing in convertible securities can be very attractive for investors. Generally, these convertible bonds are interest-paying bonds that can be swapped for shares of the issuing company's stock at a predated price. The bond-like yield aspect of a convertible protects against stock declines, while the ability to convert into stock offers shelter against falling bond prices. Using closed end funds, investors can maximize its return if there is an arbitrage between the fund’s NAV and fund’s price. The yield of these convertible closed end funds can be higher than convertible ETFs or convertible mutual funds. 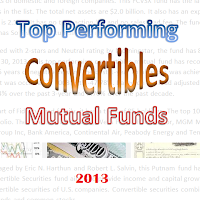 Top convertible mutual funds 2014 are PIMCO Convertible, Columbia Convertible Securities, Miller Convertible Bond, etc. Convertible funds use its assets to purchase portfolio of bonds that can be converted into stocks at a set price. 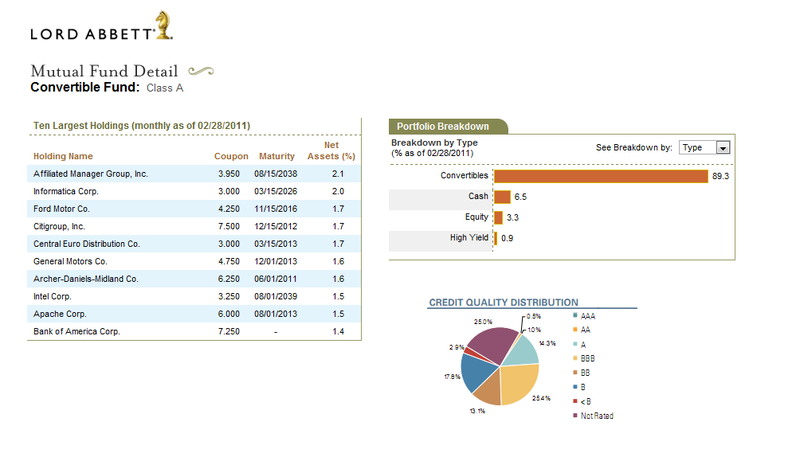 These bond funds also pay a high yield due to lower credit quality of the bonds. You can invest in regular investment account, retirement account, 401(k) account, etc. These best performing mutual funds are sorted based on its year to date return in 2014. You may find other fund review information: expense ratio, fund’s NAV, management, objective, yield, top holdings, etc. 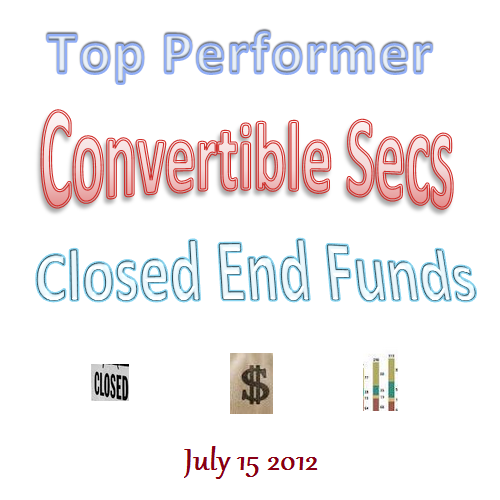 Find top performer convertible securities CEFs June 2013. These closed end funds are hybrid of bond and stock funds. Convertible bond closed end funds utilizes its assets to purchase portfolio of bonds that can be converted into stocks at a set price. These bonds typically have lower credit quality or unrated. The main risk of investing in this fund is liquidity risk due to low demand. It also has a high yield for income. You can invest in regular investment account, retirement account, 401(k) account, etc. 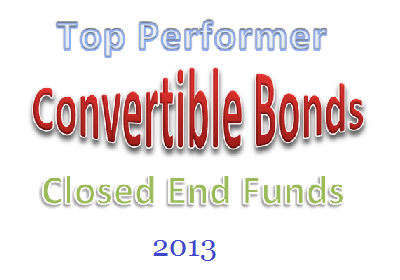 These best performing closed end funds are sorted based on its 1 year total return up to July, 1 2013. 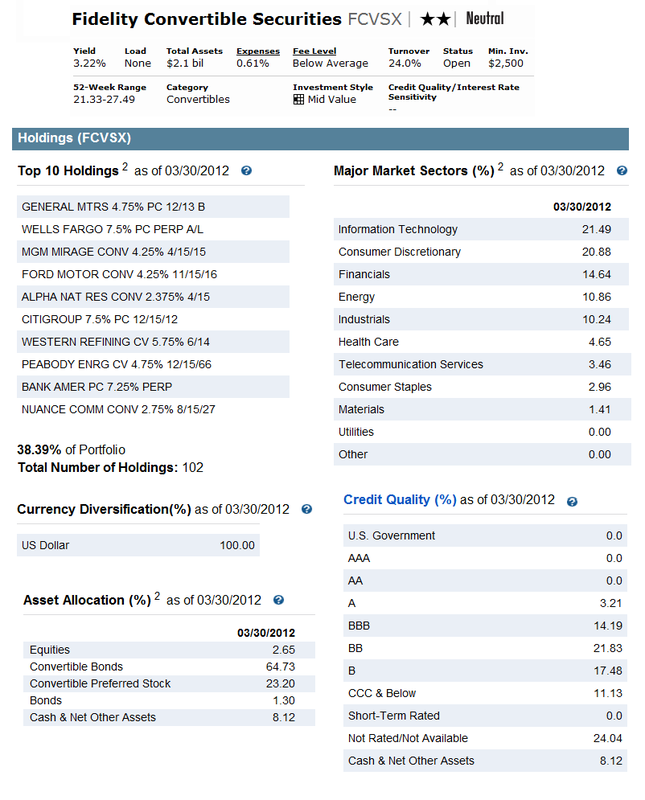 You may find other fund review information: expense ratio, fund’s NAV, management, objective, yield, top holdings, etc. 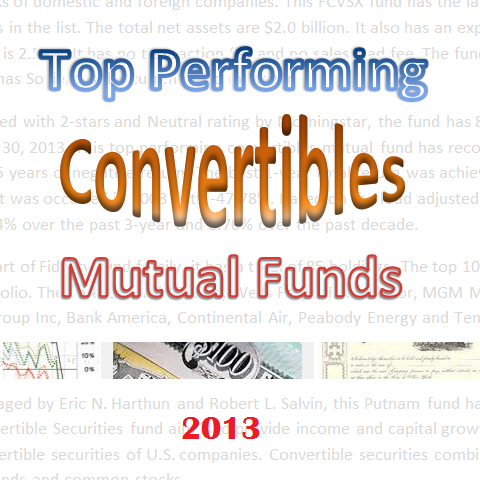 The top performing convertibles mutual funds May 2013 are Fidelity Convertible Securities fund, Putnam Convertible Securities, etc. These convertible funds provide income for investors. Convertibles mutual funds are part of balanced funds. They invest primarily in convertible bonds and convertible preferred stocks. The portfolios provide investors a capital growth opportunity and regular income. The convertible bonds in the mutual fund allow the fund to convert the bonds into shares of stock. The funds act like stocks and like bonds; hence they are part of balanced fund. Investors can buy this convertibles mutual fund from brokerage such as Vanguard, Fidelity, T. Rowe Price, and other brokers. This fund can be bought with as little as $1,000 or $250 for your investment account or retirement account. 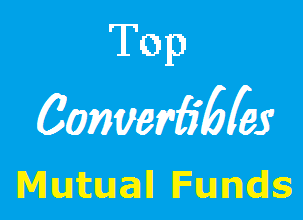 You can find the best performing convertibles mutual funds below. These top performers are sorted based on its 1 year return (up to May 2013). You can find the fund review from this article. Other fund information can be found below such as expense ratio, Morningstar rating, fund’s NAV, managers, fund’s holdings, yield, etc. 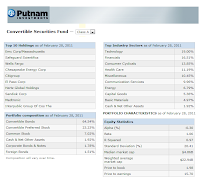 One of the popular PIMCO mutual funds is PIMCO Convertible fund. 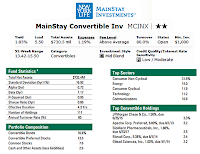 This convertible mutual fund invest in variety of convertible securities. You will find this bond mutual fund review below. The investment aim of PIMCO Convertible fund is to achieve maximum total return, consistent with prudent investment management. 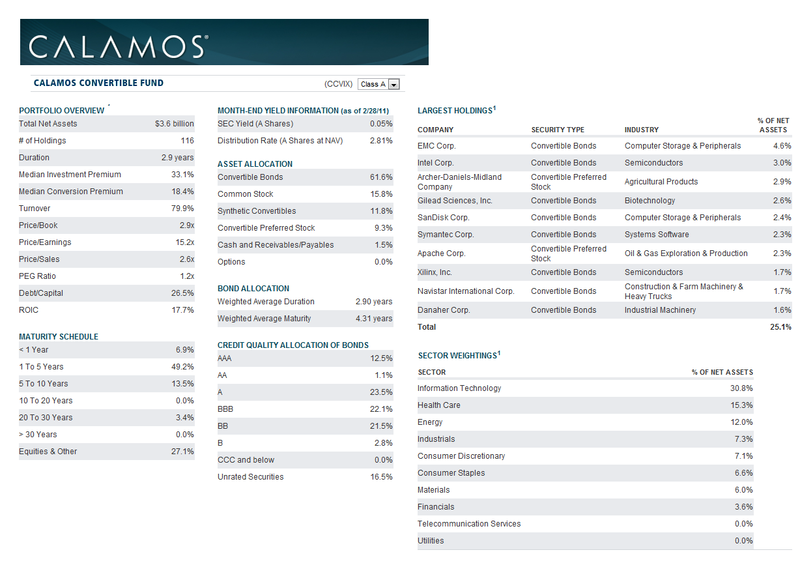 This PIMCO fund uses its assets to purchase a diversified portfolio of convertible securities. It may use forwards or derivatives such as options, futures contracts or swap agreements. This convertible bond fund may invest in both investment-grade and high-yield bonds. 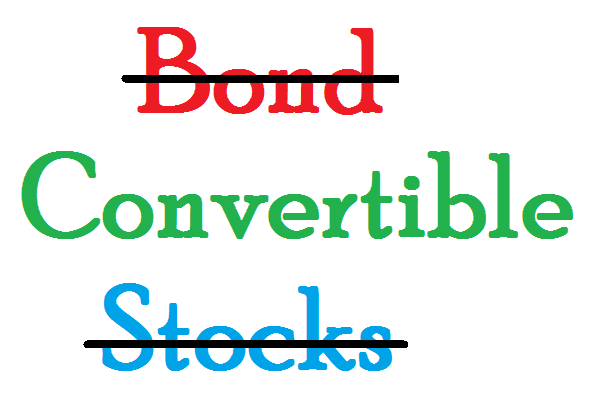 As discusses in my previous part 1 article, convertible bonds can provide additional asset diversification for long term investor and income seeker trader. There are many benefits to invest in this asset class. The rule of thumb is having 2-5% of portfolio asset in this class. 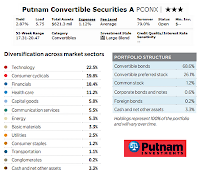 Putnam Convertible Income-Growth investment is seeking for both current income and capital appreciation. It as well aims for conservation of capital. The major net assets investment is in convertible securities with below investment-grade rating and investment-grade rating. The maturity level of these securities is three years or longer (intermediate- to long-term stated maturities). 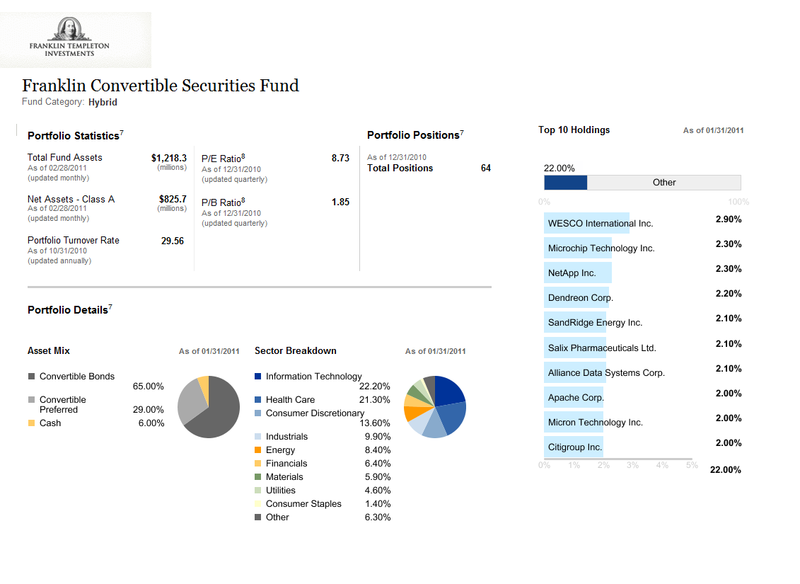 Robert L. Salvin has managed this convertible bond fund since Dec 30, 2005. This fund has the 1.18% of annual expense ratio.The 12b1 fee is 0.25% and its front-end sales load is 5.75%. The minimum balance to invest in brokerage account of this fund is $500 (same applies for PCNBX, PRCCX and PCNMX), there is no IRA account available. The other class tickers of this fund are PCNBX, PRCCX, PCNMX, PCVRX and PCGYX. The PCGYX fund has the lowest expense ratio in this fund (0.93%). The top ten holdings as of February 28, 2011 are Emc Corp/Massachusetts, Safeguard Scientifics, Wells Fargo, Chesapeake Energy Corp, Citigroup, El Paso Corp, Hertz Global Holdings, Sandisk Corp, Medtronic and The Interpublic Group of Cos. The top industry sectors as of February 28, 2011 are Technology (19.00%), Financials (16.51%), Consumer Cyclicals (13.85%), Health Care (11.19%), Miscellaneous (10.45%), Communication Services (9.96%), Energy (6.79%), Capital Goods (5.36%), Basic Materials (4.97%) and Cash & Net Other Assets (1.92%). 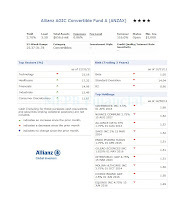 The investment in Allianz AGIC Convertible Fund seeks for maximum total return. It means that it is aiming for both capital appreciation and current income. The net assets investment of this fund is 80% in convertible securities of any size market capitalization and 20% in nonconvertible debt securities. The convertible securities may include debentures, corporate bonds, notes or preferred stocks and their hybrids. Douglas G. Forsyth has managed this fund since Dec 31, 1993. This fund has no yield distributed. The expense ratio of this fund is 0.96% per year. The 12b1 fee of this fund is 0.25% with 5.50% front-end sales load. This fund has returned 7.62% over the past three years and 6.22% over the past ten years. The minimum balance to invest in this best mutual fund is $1,000. No IRA account is available. The purchase of this fund is limited to 19 brokerages such as Scottrade Load, JPMorgan, Fidelity Retail FundsNetwork, Ameriprise Brokerage, CommonWealth Core, Raymond James, CommonWealth Universe, RBC Wealth Management-Network Eligible, TD Ameritrade Retail and DailyAccess Corporation Mid-Atlantic. The other class tickers of this fund are ANNAX, ANZCX, ANZDX, ANNPX, ANCMX and ANZRX. Some asset classes of fund have lower expense ratio fee, and no front end sales charge fee. 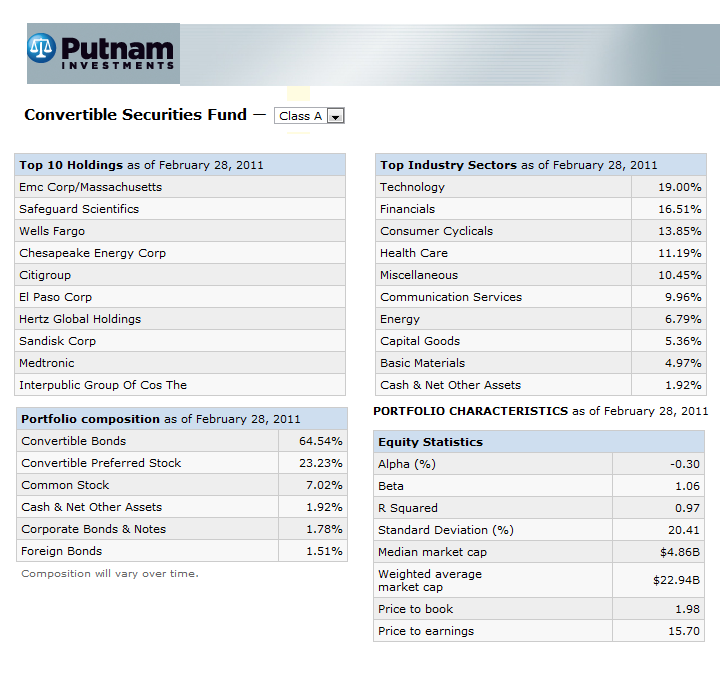 The top sectors of this fund as of Feb 28, 2011 are Technology (19.93%), Healthcare (14.30%), Consumer Discretionary (13.82%), Industrials (10.55%) and Financials (10.24%). The top 10 holdings of this fund are EMC Corp (1.40%), Symantec Corp (1.40%), General Motors Co (1.37%), Liberty Media (1.36%), Fifth Third Bancorp (1.31%), Archer Daniels (1.30%), Stanley Black + Decker I (1.30%), Developers Divers R (1.30%), Enersys (1.28%) and Wesco International (1.28%). Columbia Convertible Securities investment seeks for total return consistent with capital appreciation and current income. The composition of the net assets investment of this fund is (up to) 80% in below investment-grade convertible securities, (up to) 15% in Eurodollar convertible securities and (up to) 20% in foreign securities. David L. King has managed this fund since Apr 6, 2010. This fund has 3.14% yield. The expense ratio of this fund is 1.20% per year. There is a 0.25% 12b1 fee and 5.75% front-end sales charge fee. This fund has returned 17.55% over the past one year and 3.45% over the past five years. The minimum balance to invest in the brokerage account of this fund is $2,500 (applies for other class) and $1,000 for IRA account. The other class tickers of this fund are NCVBX, PHIKX and NCIAX. Among all classes, only NCIAX doesn’t apply the 12b1 fee. The top holdings of this fund as of Dec 31, 2010 are Citigroup (2.8%), Invitrogen (2.5%), Gilead Sciences (2.4%), General Motors Co (2.1%), Ford Motor Company (1.9%), EMC CORP (1.7%), Micron Technology (1.5%), MGM Mirage (1.5%), Alexandria Real Estate (1.5%) and Dollar Financial Corporation (1.5%). The assets allocation of this fund is as below convertible bonds (73.3%), preferred stock (22.0%), common stock (1.0%), corporate bonds (0.5%) and cash & equivalents (3.3%). The investment in Invesco Van Kampen Harbor seeks for both current income and capital appreciation, consistent with capital preservation. This ACHBX fund invests at least 50% in convertible debt securities, up to 45% in common stocks and up to 25% in foreign securities. For the investment reason, this fund may buy and then sell certain derivative instruments (options, futures contracts and options on futures contracts). 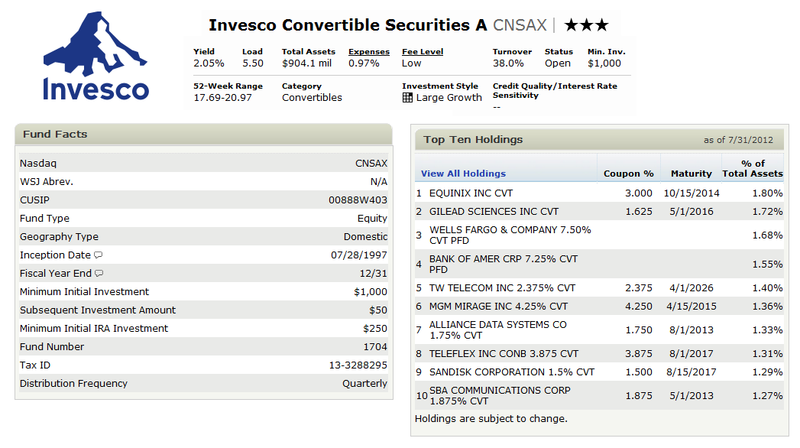 This convertibles fund is managed by Ellen Gold since Aug 23, 2001. The yield for this fund is 3.27%. The expense ratio is 1.04% annually. The 12b1 fee is 0.25% with 5.50% front-end sales charge fee. This fund has returned 6.78% over the past three years and 4.45% over the past ten years. The minimum balance to invest in either brokerage or IRA account of this fund is $1,000. The other class tickers of this fund are ACHAX, ACHCX, ACHJX and ACHIX . The ACHIX has the highest yield among all (3.48%) with no 12b1 fee and no sales load. The top 10 holdings of this fund as of Feb 28, 2011 are Nielsen Holdings NV, EMC Corp, SBA Communication Corp., Virgin Media Inc., Micron Technology Inc., Chesepeake Energy Corp., Endo Pharmaceut Holdings In, Ciena Corp., Symantec Corp and Alliance Data Sys Corp. The top industrial sectors are Semiconductors (5.52%), Biotechnology (4.90%), Health Care Equipment (3.96%), Pharmaceuticals (3.79%), Internet Software & Services (3.55%), Wireless Telecommunication Services (3.12%), Computer Storage and Peripherals (3.09%), System Software (2.68%), Communication Equipments (2.45%) and Health Care Services (2.32%). Lord Abbett Convertible investment seeks for both current income and capital appreciation to result in a high total return. The net assets investment composition of this fund is at least 80% of net assets in convertible securities, up to 25% in investment grade convertible securities, up to 20% in non-convertible debt or equity securities and max of 20% in foreign securities and lower-rated convertible securities. This balanced fund has been managed by Christopher J. Towle since Jun 30, 2003. This fund has the highest yield among the other mentioned in this list (3.79%). The expense ratio of this fund is the same as the average in the category (1.41%). There is a 0.20% 12b1 fee and 2.25% front-end sales charge fee. This convertible bond fund has returned 4.33% over the past three years and 4.32% over the past five years. The minimum balance to invest in this fund is $1,000 for brokerage account and $250 for IRA account. This fund can be purchased from 92 brokerages such as Morgan Stanley Advisors, Pershing FundCenter, Schwab Institutional, Td Ameritrade, Inc., Scottrade Load, Merrill Lynch and Edward Jones. 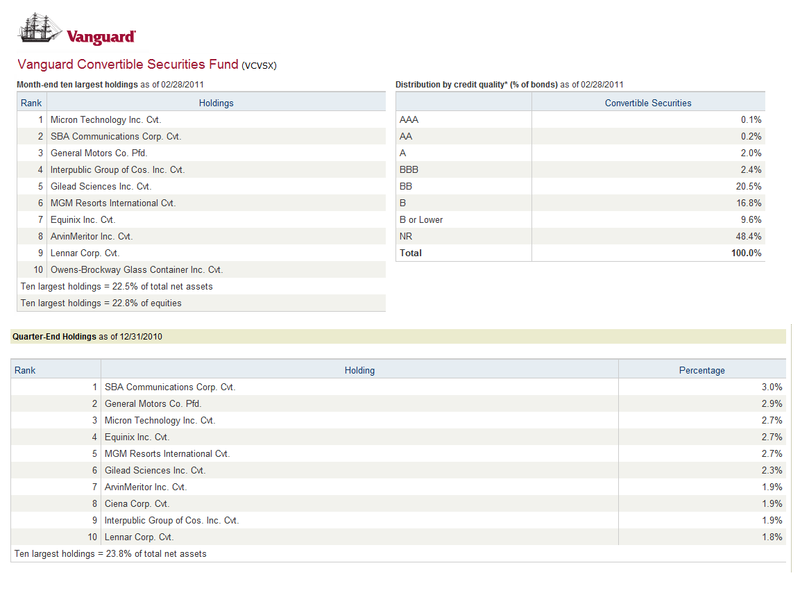 The other class tickers of this fund are LBCFX, LACCX, LBFFX, LCFYX, LCFPX, LBCQX and LCFRX. With the minimum investment of $1,000,000, LCFYX has the highest yield in the class (4.09%). The ten largest holdings as of Feb 28, 2011 are Affiliated Manager Group, Inc. (2.1%), Informatica Corp. (2.0%), Ford Motor Co. (1.7%), Citigroup, Inc. (1.7%), Central Euro Distribution Co. (1.7%), General Motors Co. (1.6%), Archer-Daniels-Midland Co. (1.6%), Intel Corp. (1.5%), Apache Corp. (1.5%) and Bank of America Corp. (1.4%). Note: If you need to check the fund performance, please check my first article. There are several advantages for investors to invest in convertible securities mutual funds. One of them are getting a regular income. 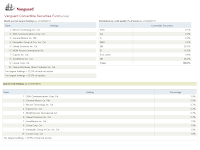 These posts will look into the best convertible mutual funds of 2011 including: Calamos Convertible A, Fidelity Convertible Securities, Vanguard Convertible Securities Inv, etc. With interest rate hikes are looming, investing in convertible bonds can be attractive to investors and/or traders. Convertible bonds can provide additional investment portfolio diversification. There are several ways to invest in convertible bonds. Investors can invest in individual convertible bonds, mutual fund, closed end fund (CEF), and exchange traded fund (ETF). 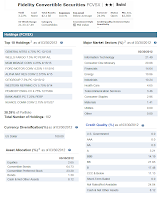 These funds are rated based on their asset, Morningstar rating, and expense ratio. These funds have big assets. Big asset means the fund has attracted variety of retail investor and institutional investor to invest in these funds. Most of these funds also have a respectable Morningstar rating of 3 or more stars. With 3 or more star rating, this means the fund has consistently performed under any market condition (bear or bull market) and should perform better than many of its index benchmark. These funds also paid dividend either monthly or quarterly. The investment in Calamos Convertible fund primarily is seeking for current income while the capital growth is the secondary purpose. This fund invests the majority (around 80%) of its net assets in convertible securities issued by U.S. and foreign companies. There is no limitation of the market capitalization. The remaining assets might be invested in foreign securities. This fund will be closed to all purchases of shares and exchanges, with limited exceptions, as of January 28, 2011. John Calamos the founder of Calamos Assets Management has managed this fund since 1985. The company is the 16th largest money manager in Chicagoland. This fund has 1.08% expense ratio per year. The yield of this fund is 2.73%. There is 0.25% 12b1 fee and 4.75% of front-end sales load. 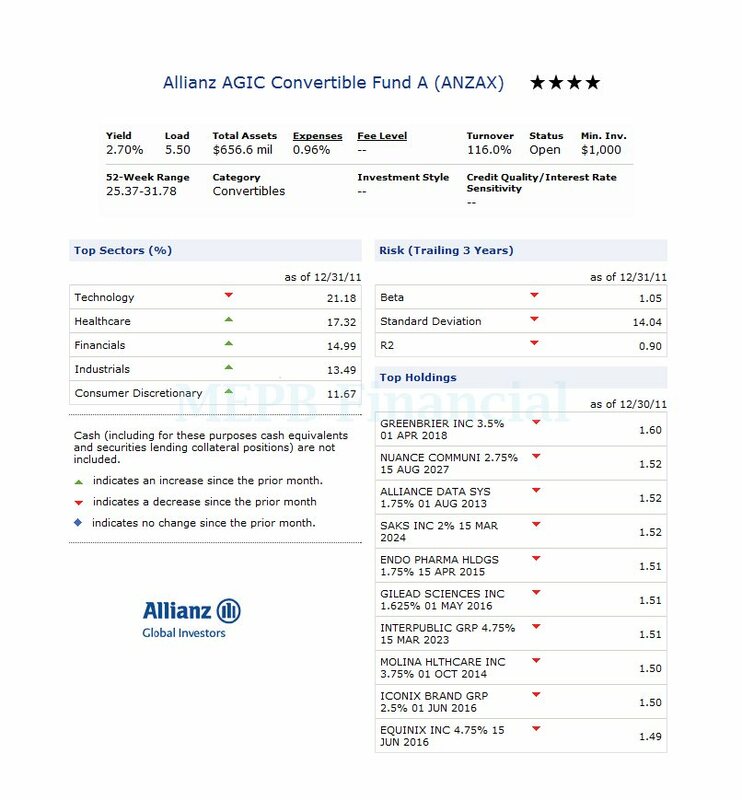 This convertibles fund has returned 11.74% over the past one year and 5.16% over the past five years. The minimum balance to invest in this fund is $2,500 for brokerage account (same applies for CALBX and CCVCX) and $500 for IRA account. This fund can be purchased from 89 brokerages include Schwab Institutional, TD Ameritrade, Inc., Scottrade Load, JPMorgan, Vanguard and Schwab Retail. The other class tickers of this fund are CALBX, CCVCX, CICVX and CCVRX. Eventhough CALBX and CCVCX have the same minimum initial investment, but they have higher expense ratio (1.82%) compared to CCVIX. The top 10 holdings of this fund are EMC Corp (4.6%), SanDisk Corp (3.4%), Intel Corp (2.6%), Archer-Daniels-Midland Company (2.6%), NetApp, Inc (2.4%), Apache Corp (2.2%), Teva Pharmaceutical Industries Ltd (1.9%), Gilead Sciences Inc (1.8%), Symantec Corp (1.6%), and Navistar International Corp (1.5%). These top 10 companies make up to 24.6% of its total assets. The top sectors of this fund are Information Technology (33.8%), Health Care (15.3%), Energy (10.3%), Industrials (8.4%), Materials (7.6%), Consumer Discretionary (6.6%), Consumer Staples (5.2%) and Financials (4.3%). Fidelity Convertible Securities investment seeks for both current income and capital appreciation. The major net assets investment of this fund is in convertible securities with below investment-grade rating or unrated securities. This best fund may also invest in corporate or U.S. government debt securities, preferred stocks, money-market instruments, and common stocks. Thomas T. Soviero has been the lead manager since June 21, 2005. This fund has quite low annual expense ratio (0.59%) compared to the average in 1.41%. This fund has a total of $2.72 billion net assets. It doesn’t have any 12b1 fee and front-end sales load. This fund has returned 7.10% over the past five years and 6.80% over the past decade. The minimum balance to invest in this fund and the other class is $2,500 for brokerage account. You can also purchase this fund through Fidelity Advisors fund. The other class tickers of this fund are FCAVX, FCBVX, FCCVX, FICVX and FTCVX. Only FICVX doesn’t have any 12b1 fee and front-end sales load. The top ten industry sectors of this fund as of Jan 31, 2011 are Energy (23.02%), Information Technology (17.74%), Consumer Discretionary (12.97%), Industrials (12.92%), Financials (12.89%), Health Care (6.99%), Consumer Staples (3.77%), Materials (3.45%) and Telecommunication Services (2.28%). The top ten company holdings are Peabody Energy Cv (4.75%), El Paso Corp (4.99%), Wells Fargo (7.5%), General Motors (4.75%), Ford Motor Conv (4.25%), Intel Conv (3.25%), Celanese Corp Ser A, Chesapeake Enrg Cv (2.5%), Hertz Global Conv (5.25%) and Alpha Nat Res Conv (2.375%). These top 10 holdings make up to 35.62% of the total net assets out of 132 total holdings. Vanguard Convertible Securities Investor investment is looking for both current income and long-term capital appreciation. The primary net assets investment is in convertible securities. These convertible securities have the below investment-grade rating and combine the investment characteristics of bonds and common stocks. They consist of corporate bonds and preferred stocks that are convertible into common stock. This fund is managed by Larry Keele since Nov 1, 1996. 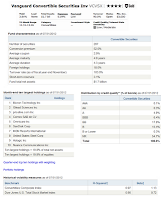 This fund has 3.64% yield and 0.68% annual expense ratio (the lowest among all mentioned in this list). The minimum balance to invest in this fund is $10,000 for brokerage account and IRA account. This fund applies no 12b1 fee and no sales load. This fund has returned 23.85% over the past one year and 7.82% over the past ten years. The top 10 holdings of this fund as of Feb 28, 2011 are Micron Technology Inc Cvt, SBA Communications Corp Cvt, General Motors Co Pfd, Interpublic Group of Cos Inc Cvt, Gilead Sciences Inc Cvt, MGM Resorts International Cvt, Equinix Inc Cvt, ArvinMeritor Inc Cvt, Lennar Corp Cvt and Owens-Brockway Glass Container Inc Cvt. These ten largest holdings make up to 22.5% of total net assets and 22.8% of equities. Franklin Convertible Securities investment pursues for maximizing the total investment return with considering the consistent reasonable risk. The major net assets investment is in convertible securities including the common stocks received upon conversion of convertible securities. This fund may also invest in other securities, such as common or preferred stocks and non-convertible debt securities. As of Jan 31, 2011 the composition of its net assets investment is 65.00% in convertible bonds, 29.00% in convertible preferred and 6% in cash. Alan Muschott has managed this fund since Jul 1, 2002. He is as well the vice president of the Franklin Advisers, Inc. This fund has 1.22 billion net assets. The yield for this fund is 3.23%. This fund has 0.90% annual expense ratio which is quite low compared to the average in 1.41%. The 12b1 fee is 0.25%. This fund has returned 5.67% over the past three year, with 5.64% of 5-year average return. Minimum balance to invest in brokerage account of this fund is $1,000 and $250 for IRA account. This fund can be purchased from 60 brokerages such as Morgan Stanley Advisors, Pershing FundCenter, Schwab Institutional, Td Ameritrade, Inc., JPMorgan and Merrill Lynch. The other class tickers of this fund are FCSZX and FROTX. The expense ratio for FCSZX is 0.65% and 1.65% for FROTX. Top 10 holdings of this fund as of Jan 31, 2011 are WESCO International Inc (2.90%), Microchip Technology Inc (2.30%), NetApp Inc (2.30%), Dendreon Corp (2.20%), SandRidge Energy Inc (2.10%), Salix Pharmaceuticals Ltd (2.10%), Alliance Data Systems Corp (2.10%), Apache Corp (2.00%), Micron Technology Inc (2.00%), and Citigroup Inc (2.00%). These top 10 holdings make up to 22.00% of the total portfolio. The top sectors breakdown are Information Technology (22.20%), Health Care (21.30%), Consumer Discretionary (13.60%), Industrials (9.90%), Energy (8.40%), Financials (6.40%), Materials (5.90%), Utilities (4.60%) and Consumer Staples (1.40%). 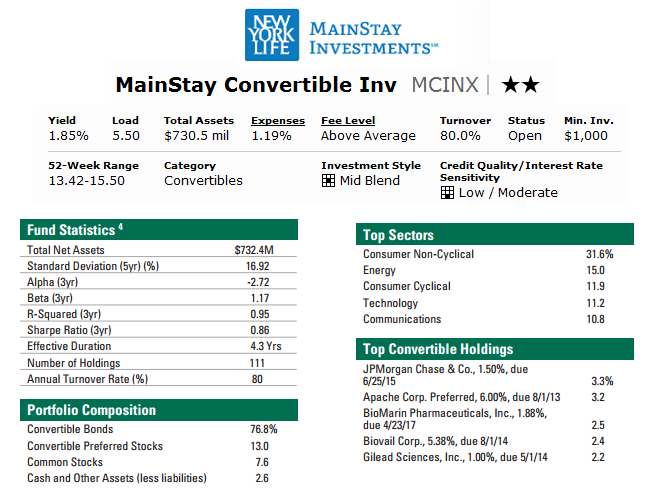 The investment in MainStay Convertible is looking for both current income and capital appreciation. The primary net assets investment (at least 80% of total) is in investment-grade convertible securities. The other investment options include equity securities, nonconvertible corporate debt, cash or cash equivalents and U.S. government securities. This fund has a total of 1.04 billion net assets. Edward Silverstein has been the fund manager since May 1, 2001. This fund has 1.18% yield. The expense ratio of this fund is 2.03% per year. This fund has 1.00% of 12b1 fee but no sales load. The minimum balance to invest in either brokerage or IRA account of this fund is $1,000. The other class tickers of this fund are MCOAX, MCCVX, MCNVX and MCINX. Some other class has lower expense ratio. Top ten holdings of this fund are JPMorgan Chase & Co (3.5%), Core Laboratories LP (2.7%), Cameron International Corp (2.6%), Teva Pharmaceutical Finance Co BV (2.5%), Citigroup Inc (2.2%), Fisher Scientific International Inc (2.1%), Incyte Corp Ltd (2.0%), BioMarin Pharmaceuticals Inc (2.0%), Peabody Energy Corp (2.0%), and Allegheny Technologies Inc (1.9%). The top sectors of this fund are Consumer Non-Cyclical (24.8%), Energy (21.1%), Communications (11.0%), Technology (9.7%), Consumer Cyclical (9.7%), Industrials (6.5%), Financials (6.2%), Asset-Backed Securities (1.9%), Basic Materials (1.7%) and Utilities (0.6%). 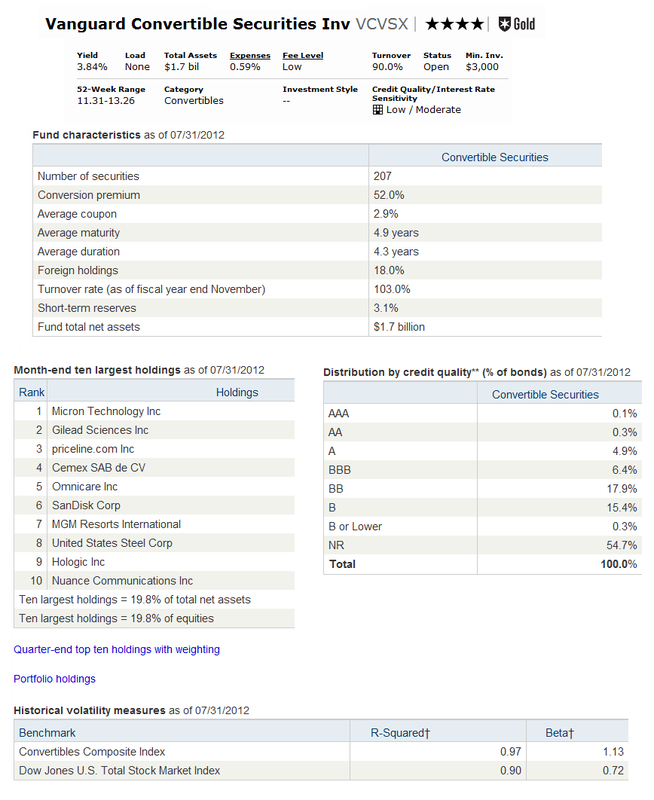 Details on next 5 funds can be found on Top Convertible Bond Mutual Funds pt 2. The following table show the fund performance for 1 year, 3 year, 5 year, and 10 years. 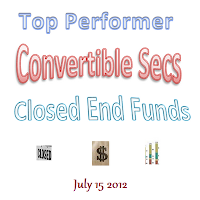 Please check my part 2 for the next 5 of these convertible bond funds.